Mahabubnagar district Collector Ronald Rose along with environmentalists Manoranjan Bhanja and PN Vasanthi at the Climate Change Media Workshop on Tuesday. Mahabubnagar: The three-day climate change media workshop in Mahabubnagar, which was jointly organised by Centre for Media Studies (CMS), Ministry for Environment, Forests and Climate Change (MOEFCC), Deutsche Gesellschalt Fur Internationale Zusammenarbeil (GIZ) and EPTRI got off to a great start on Tuesday, with experts in subject matter sharing their observations supported by scientific research and predictions about the much-talked issue facing the world. 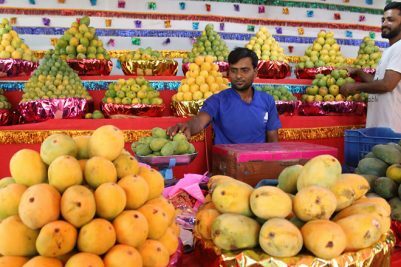 The bottom-line as echoed by one and all, was that “climate change is for real” and that media needs to play a more important part in educating the rural masses about it. Speaking on the occasion, Dr J Sesha Srinivas, Sr Scientist, EPTRI says Telangana government has taken climate change adaptation programmes such as Mission Kakatiya, Mission Bhagiratha, Haritha Haram, becoming the most productive State in terms of solar energy generation (3250 MW) across the country and through Musi River conservation using the Green Climate Fund of Rs 1,600 crore (Rs 1,000 crore borne by the State government). 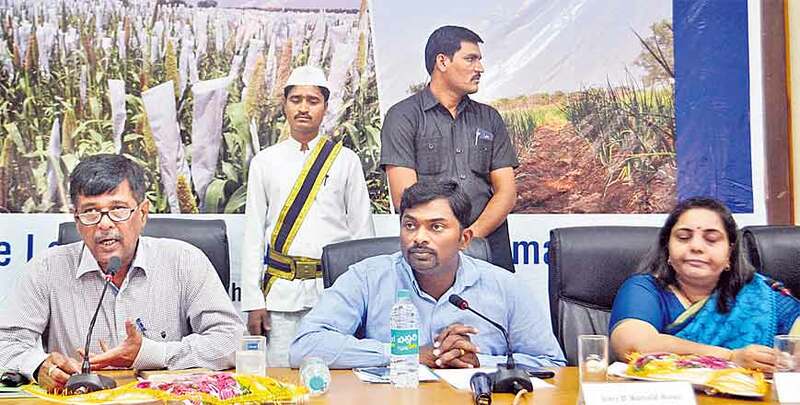 Prof Jayashankar Telangana State Agricultural University (PJTSAU), in association with ICRISAT and NABARD are doing an alternative livelihood project in Jadcherla, Bijinepally and Ghanpur mandals with a cost of Rs 24 crore for climate resilient agricultural interventions. For the first time in India, mandal-wise climate analysis is being done by ICRISAT. Converting waste into natural gas in social welfare hostels and reducing intensity of carbon emissions and creating additional carbon sink are among the priorities of the State government. Dr M Venkata Ramana, Associate Director of Research, PJTSAU informed that we have developed RNR-15048 Telangana Sona paddy variety, which has a harvesting time of 125 days, as against BPT which needs 164 days to harvest. This new variety takes less water and is Nblast resistant, with short and slender form with easy cooking. We have also developed a pigeon pea variety called PRG-176 which has a harvesting duration of 135 days. According to UoH professor Dr Ashok Karumuri extreme rainfall events have increased in Telangana in the past 10-15 years, especially in the months of June and August. So should we say it is all because of climate change? Presently there are no clear climate models we can rely on for 100 per cent accurate prediction. Therefore, new technology needs to be used to predict extreme weather events in Telangana. High performing supercomputers need to be used. Among many models we need to be able to come up with an accurate model with the right data needed. One thing is for certain. Between 2011 and 2060, when carbon emissions are controlled, we will see an increase in rainfall in Telangana. Dr M Prabhakar, Principal Scientist, Central Research Institute for Dryland Agriculture, added that a single technology will not work. It has to be a combination of technologies. D Ronald Rose, district Collector said the impact of climate change can be seen here in Mahabubnagar district. Orientation of farmers with regard to resilience to climate change needs to happen and media needs to do this by reaching-out to farmers in their local language. “We can say with pride that we have constructed 7,000 farm ponds in the district last year and are going to construct 10,000 this year. We have become the first district to give 100 per cent soil health cards. We have a target of planting 2 crore saplings as part of Haritha Haram this year.